Street photography etiquette is a tricky subject. It’s subjective. It also can be difficult to practice proper etiquette on the street when someone takes offense to you photographing them. While I certainly don’t have all the answers, I have done quite a bit of street photography and share my personal take on street photography etiquette in this article. I don’t really want to delve into the legality of street photography that much in this article because I want to focus mostly on the etiquette side of things, but it’s important to be familiar with at least the general laws in the place where you’re photographing. I live in the United States and for the most part, if you’re in a public place, people are not granted the same level of privacy as in private spaces and it’s completely legal to include people in street photography images. These laws vary from country to country, however, so if you’re from another country or you plan on visiting another country and want do street photography there I suggest taking a look at this list of country-specific regulations. In the majority of countries, you don’t need consent to take photos of people in public spaces (although publishing them in major publications may be a different story). I think it’s important to be aware of the laws regarding street photography wherever you’re doing it, for obvious reasons. But flaunting it to someone who’s expressed discomfort to your photographing them isn’t going to improve the situation for either party. One of the least negative outcomes to result from acting like this is probably just having an empty feeling of superiority. It won’t make your photos better and any time you spend arguing with people over minute details could be time wasted that you could be using to photograph more. In other words, I think it’s a good idea to take the course of least resistance when it comes to dealing with people who take offense to street photography. If that means calmly explaining what you’re doing or even potentially deleting a photo, then so be it. The good news is the vast majority of street photographs you take will turn out to be total flops anyway, so you’re unlikely to be losing much by deleting a photo. In most countries, doing street photography and including people as subjects in public places is completely legal, regardless of what some police officers on the street may tell you. However, just because you can, doesn’t mean you should. Just like you could click the shutter button in every circumstance when you can get a person in your frame, doesn’t mean you should. If you did that, you’d end up with a bunch of poorly-composed, uninteresting photographs. Likewise, if you treat every confrontation like it’s your shot to educate the world about street photography law, you’re gonna have a bad time (and probably waste yours). In terms of etiquette on the streets, we’re mostly talking about number 2. Number 1 falls more under ethics in my opinion. Regardless, I think it’s worth focusing on when talking about the etiquette of street photography. The reason being is that you’ll deal with less confrontation and skepticism if you’re more selective about what you photograph in the first place. A lot of this is culture/location dependent and also this is a sense that you build naturally over time, but there are some things that are probably best left unphotographed (although there are always exceptions). The first thing that comes to mind is photographing kids. It’s unfortunate because kids make great subjects considering how emotive they are. They wear their feelings on their sleeves and are just real. These images were not shot in the US/Europe. The thing is, many parents in Western countries are sketched out by the thought of strangers photographing their kids (which is often within good reason and they’re just trying to be protective). It’s just annoying as a street photographer knowing that you’re doing something as an artistic pursuit and having people misconstrue what you’re doing. There are plenty of other things we need to keep in mind as street photographers but a big one is being aware of marketplaces where vendors are selling potentially illegal goods. These are the types of places that are not found in the U.S. They can be a mixture of businesses that sell legal and illegal products. As far as the guys who sell the illegal merchandise goes, they don’t want to be photographed so they don’t get caught. And they don’t differentiate between anyone who holds up a camera in their direction. But in the end, we need to be aware of other people’s feelings and have respect for their boundaries. Not only that but we can take stock of what we’re able to photograph in a given area as we do it. Take one exposure and reevaluate and if the people/subjects accept you there then it’s probably OK to keep shooting. If you do street photography and include people as subjects in your photos, you will invariably be confronted by people. They may just be curious or confused about what you’re doing, but people can get angry as well. It’s easier said than done, but the approach I try to stick to is simple: just be respectful and stay as calm and collected as possible. If someone asks me what I’m doing, I usually respond with something to the effect of “oh I’m just doing some street photography”, and take it from there. If it’s blatantly obvious that I took someone’s photo and they come up to me, I’ve also had some success diffusing the awkwardness by saying I photographed them because I liked their style. This can work because people like being complimented. If someone is really blowing up on you and losing their mind, what you end up doing is largely up to you. There’s no one-size-fits-all approach to this but reacting to the situation with as much maturity as possible goes a long way. Sometimes walking away is the best option. In the end, you’re under no obligation to sit there and take abuse from irrational people who can’t keep their emotions in check. Often times while doing street photography people will notice that you took a photo in their direction. In this section, I’m mostly referring to the situations in which subjects do things like make eye contact with you, look at you quizzically, shoot you a mean stare, etc. Basically, any reaction without verbally confronting you. Obviously, there are a number of ways you can approach this and if you feel more comfortable doing it a certain way then you should do whatever feels right to you. Walking away without making eye contact. I think this is usually one of the best options because the majority of the time people will just let you go without confrontation. Bring your camera down, look at the LCD and act like you were shooting behind the person or at something above them. You can even continue photographing them and keep looking back down at your LCD as if you’re checking your exposure. You not acknowledging the person can make them think you must be pointing your camera at something other than them. (This takes acting skills that I don’t have so I don’t do it). Smile, say thanks, and wave. Smiling has the effect of showing you’re not some total creep and can be disarming. Sometimes just doing small things like this can diffuse any tension. Make small talk. Talk about the weather. Say you’re just testing out your new camera or whatever. You may actually meet some interesting people this way. I know I have. I wish I could say definitively that you should take ‘X’ course of action in ‘X’ situation, but it’s not that simple. Sometimes you just have to play it by ear. On the bright side, I think you get better at this as you go along and get more experienced doing street photography. This is pretty self-explanatory, but I just wanted to reiterate that we should respect the people we encounter on the street. It would never be my intention to degrade or demean anyone through street photography—and that even goes for the confrontational people as well as everyone else. My goal is to share the street as it is in a creative and visually-pleasing way, not to put anyone down. If you see that someone is visibly uncomfortable by you photographing in their vicinity, I don’t see the point in sticking around. Usually, it will amount to nothing but it could also lead to a confrontation from the subject or someone they know that’s with them. There’s always more to photograph. Would you want a photograph published of you in an embarrassing situation? I assume not. I try to take this into consideration when including people in my frames. This is partly why I don’t take photos of the homeless. These are the most vulnerable people in society, who may have lived lives just like you and me before their circumstances took a downturn. I prefer to give them money rather than photograph them. On top of the etiquette factor, photographing the homeless is not technically challenging and not very visually appealing. I think an exception to this would be doing an extended project on the homeless in a certain area that the photographer gets to know. I think projects like this can have their place, but only it’s approached from a humanistic perspective and not exploitative. But this falls more under documentary photography rather than street photography. 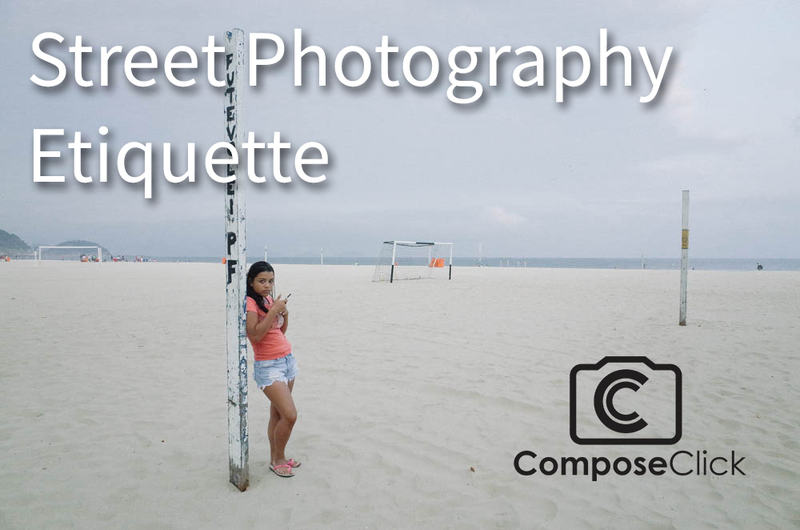 We all have different perspectives on things so the concept of street photography etiquette is going to vary some from photographer to photographer. That’s OK, the main thing I’d like for anyone reading this to take away is to treat people the way you would like to be treated and with with respect.